My miniature hobby began several years ago. I was fascinated with beautiful, realistic miniatures and dollhouses. I started to collect and create many kinds of room settings such as sweets shop, bakery shop, doctor office, pet shop, flower conservatory, nursery room, sewing room, artist studio, country kitchen room and girl’s bedroom. 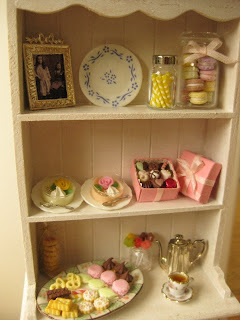 Also, I collected books and tools to make my own miniature food for my dollhouse as my future assignment. 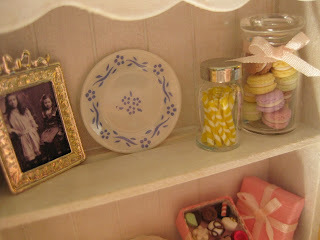 But, I did not try to make my own miniature food until recently. I don’t have years of experiences for making miniatures on my own unlike most talented miniature artisans do. Nevertheless, I discovered that I do have the ability to make quality sellable miniatures. I am inspired by many talented miniature artists who dedicate their time in making lovable handmade miniatures and wish to be part of those talented people who love miniatures. Currently I don’t take special order request, but I will in the future.